(Preferably sung by an all-female ensemble) - Link shows most of the ensemble being female, but not all. She would ideally also be under 25 years old. Instrumental version of "It's a Long Way To Tipperary"
Replace the line "It's a long, long way to Tipperary but my heart's right there" with "You were being such an idiot, so I stomped on your hand." 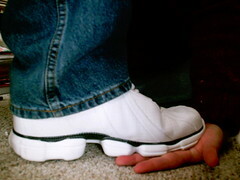 Immediately after the words "stomped on," make the stomping action with an audible thump made by the foot. So I stomped on your hand. He asked to just feel it, it soon would make a clack. But tickling her black sandal turned out to be a gaffe. He made attempt at humor, which was actively denied.